In the past four years plus, I’ve seen some amazing stories of success with player development, member engagement and retention here in the Pacific Northwest PGA Section. 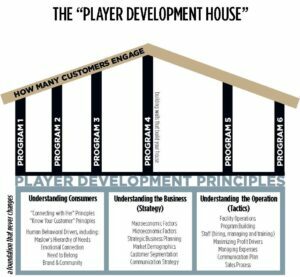 I have seen, and been blessed to help, PGA professionals get their dream job – or create it – through efforts to develop successful player development and member engagement concepts. I have also seen well-intentioned PGA professionals (and/or golf club owners) with a massive blind spot. They still believe in the old business formula: great service + great course conditions =success. Yes, service still matters and so do course conditions. But, let’s face it, our customers can get those nearly everywhere. Thinking “PGA Service” is the key to success is off-base in today’s world. That’s the same as thinking a set of MacGregor MT woods (real wood), Wilson FG-17 irons and a Titleist Pro-Traj will perform as well as any of today’s modern equipment. I started the final round of the Oregon Open at Brasada Ranch this month. One thing I didn’t see was a player teeing it up with that old equipment. Why not? Well, we all know that would be insane. And yet, there are PGA professionals, owners and board members who still think the business formula that worked before (when the Pro-Traj was still the best ball) is still the right one. That is also insane. To prove that point of view, I’d like to share a story with you. So, he decided (going into year two) to cut more here, cut more there and those two assistant professionals are gone. He thought, ‘I’m going to make due with one golf professional.’ And yet, his rounds and revenue continued to go decline. So he’s cutting costs, but his rounds and revenue are declining more. So in 2010 (at the end of the season) he looked at his figures (his profit and loss statements) and he went to the (lone) golf professional. This golf professional PREDICTED the conversation (that) was going to happen and said, ‘I know you’re in here to talk to me about cutting my job, but I’ve got a proposition for you. At the end of that next year (2011) the Birmingham coalminer (ie., the owner) decided, ‘Whoa’ I don’t know why (because no one had ever explained it to him) but there seems to be a (strong) correlation between what the pro was doing and his rounds and his (number of) members and they’d gone up. Today (fall of 2015) there are seven (7) PGA professional staff at that facility. Because, although no one has ever explained it to him, or told him how to do it. He (the Birmingham coalminer, Club owner) just noticed on his spreadsheets that if he had a (PGA professional) coach focused on bringing in members and creating coaching (eg. member retention and engagement clinics, concepts) his rounds (revenues) and members (count) went up. So, what can we learn from this true story of Grasslands Country Club? In this success story, the PGA professional created more deeply engaged customers and new members through his coaching, retention and engagement. Question: Are you in the position of the owner/the employer (aka General Manager, Dir of Golf, Head Professional)? If yes, do you have the smarts to see TALENTED, ENGAGING and ENTREPRENEURIAL PGA professionals working for you? Let me be blunt here: If you’re as old as I am, and you’re a PGA General Manager, a Director of Golf, please pay attention. If you’re not inspired by the Grasslands CC story, thinking how can I unleash my team to replicate it, etc. I feel pity for you and I am sorry for your staff. Chaining young PGA professionals with talents to engage juniors, families, women “behind the counter” is so they can pay their dues (like we did) is frankly an uninspired thought, and the definition of insanity. I realize there are some who have accepted this role and actually find joy, fulfillment in providing great service to customers, engaging with them in the golf shop. If that’s you, great. There’s still a role for you. However, it’s not a role that drives rounds, revenue and new members so we can’t say it’s a role that should be compensated for doing so. Some may try to say so, but I can’t honestly tell an owner, a Club board member or CMAA general manager that story. If you fit here, that’s okay. Be great at what you do. But please don’t complain or be jealous of those professionals who drive rounds, revenue through on-course/on range engagement and new customer/member development. These professionals may be creating an expanded opportunity for you directly and indirectly. In fact, one could say, when they win, you can win too. 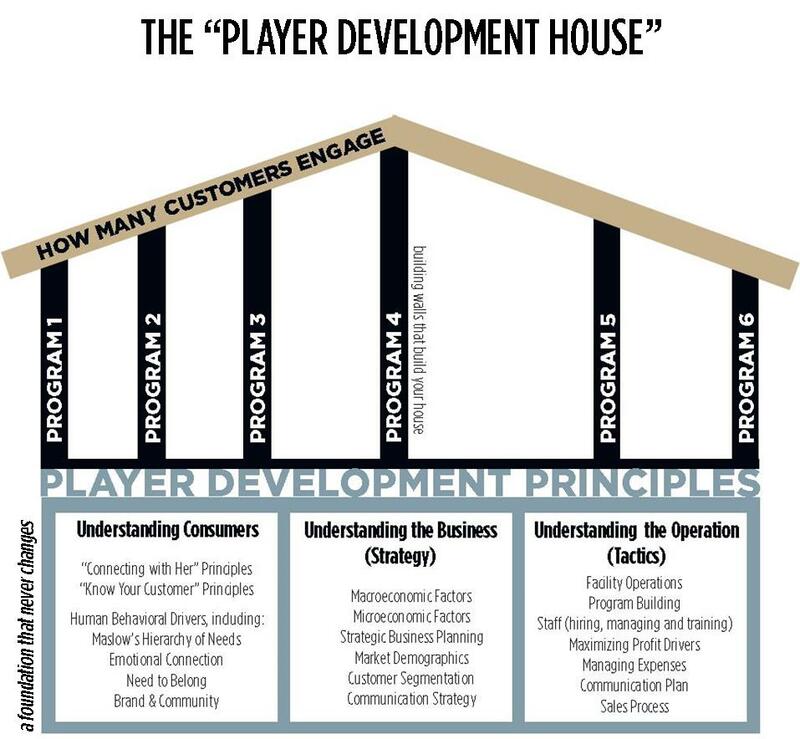 If so, maybe player development and member/customer engagement are the direction you should be going. A word of caution, this role takes energy, vision, commitment and guts! (Refer back to the lone PGA professional at Grasslands. He’s probably making six figures now, but he had to be willing to chuck the old formula and start anew.) Look in the mirror (a few times) and evaluate yourself. Are you willing to risk and “bet on yourself?” If yes, let’s get together. The focus of the Grasslands owner is on the success of his PGA professionals engagement of his current members (which drives revenues throughout the entire facility) and attraction of new members to the Club. Some people may think a golf course restaurant or Club food and beverage operation drives all of its own revenue. Except in very rare cases, that’s just not true. Fact: More engaged golfers (eg. those actively participating in clinics, instruction, etc.) spend 65% MORE on food and beverage at the facility than less engaged golfers. Some people may think members are retained through great service and course conditions. That’s also not true. Fact: More engaged golfers/members are retained at 97% (or as high as 100% in one large survey) at Clubs versus less engaged golfers/members. If your club could cut member turnover by 50% in 2016, how much would that be worth to the bottom line in member dues alone? In conclusion, I hope the story of Grasslands CC has given you a new view on the opportunity that may exist for you, your facility and your future as a PGA golf professional. I hope that you’ll share the Grasslands story with other professionals, your owner, etc. as well. I’m sure there are some learning points in the story I haven’t covered. If you’d like to discuss some of the points of view I’ve shared (or some that you discovered) or you’d like to discuss your future, I encourage you to reach out to me at your earliest convenience.